As the season possibly winds down and your competitions are over then you should absolutely take a break from swim training. Taking a break from training will refresh the mind and body. Allow you to take stock of strengths and weaknesses and areas to work on in the off season. A break from swimming is two weeks, any more and you really feel the impact as you try to come back. 3months of not swimming is 30+ sessions missed. One session swum per week is 6 days of unlearning before you start again. Imagine 3 months. Rhythm, balance and coordination will all be out of alignment. Breathing will be laboured, feel for the water obliterated and that all-important swim fitness component compromised. When it comes to the bike you have some alternates that will keep you fit and challenged. A spin class, mountain biking, various new terrains, time trialling. Running offers the chance of a treadmill, cross country, fell running, new terrains and pathways. All suitable replacements to your normal running routines but not so different that you would lose form. In fact, running cross country would probably be a great way to build some strength in your running mechanics. Unfortunately, we do not have that luxury in the pool. You cannot replace the water. You can supplement with a VASA dryland swim bench, and it is a great supplement but you cannot replace it. Sorry to say but swimming is the cruel and most demanding of the 3 and wants your utmost attention. I would estimate for each session missed you need at least 2 to come back to bring you back up to speed. From those who regularly miss the Autumn and take a lengthy break it is not until March that we see them come back to form. i.e. these are the results from one of our weekly fitness sessions. Every few months we test over 10mins and see how far swimmers can swim. It is fairly simplistic but proves a reasonable test of technique and fitness. If the courses do as they say then the swimmer should through a process of improved technique and fitness swim further in the 10mins available. We perform this at the start of a fitness course and the end 10 weeks later. Most of the year we see the courses successful i.e. 70% swim further at the end compared to the start. Xmas throws up a small blip but where the Autumn was not swum it takes months to get back to the bigger numbers. 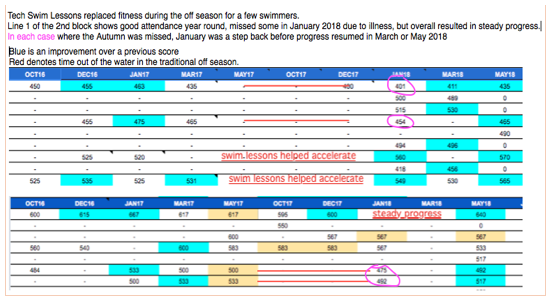 Even if the swimmer does ramp up to an improved March or May notice that those numbers while better than the last, they are not as good as their biggest scores in the Spring of 2017. You cannot substitute or cheat steady year-round progress. 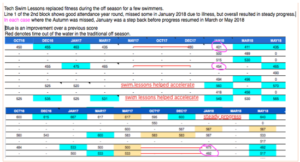 One of my swimmers works as a teacher and takes full advantage of the 6-week school summer holiday having prepared and planned for a late Spring race. Fair enough, this is the plan, this is how family dictates what is done with the off season but it is very hard getting her back into the water before xmas due to such a long period of time out. The routine has gone and getting up early or finding the time now is a burden. There are 40+ free sessions on our website available for download and in the blog. I say this as no doubt you might feel Dan has an ulterior motive ie to line his pockets. Honestly, I want you to help yourself avoid the usual January blues when so many struggle back into the water. Try to minimise the time out of the water in the off season. Stay in the pool, try other strokes, a winter challenge – there are many on the SpeedoON platform or how about a Marathon Swims. You could spend a few weeks improving technique or learning to tumble turn. Stimulate the mind with some new challenge but please don’t stay out of the water! Why would you like to race the Thames Turbo race on BH Monday? Please add your comment below and one male/female entry will be awarded to the best, Judges decision final! Leg Kick. Why is a length of kick so exhausting and does that matter? Have you ever noticed during your swimming lessons that the fastest kickers in the pool also tend to also be the fastest swimmers? It’s not an exact science, but next time you are at the pool have a look at the people in the faster lanes. 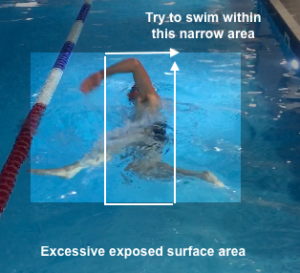 For swim coaches with multiple lanes to observe (just like at our London Bridge sessions) it is clear to us that those with the strongest leg kick are usually the fastest swimmers. 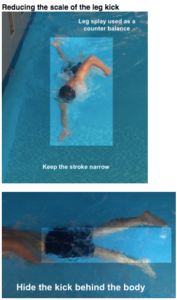 It’s all about learning how to train theyourlegs within the stroke, overcome technical issues, get fitter and therefore faster. Your bike will not be impacted if you learn to kick correctly. The misconception is that you work the legs hard for propulsion. But if you look at the pictures, you see that we work the legs to reduce and restrict bad swim habits and avoid issues that create problems. Creating this much drag will slow your bike, because you will simply be exhausted. First we unlearn the big kick ! It’s logical that big and strong kicks should produce more momentum, but not when you’re kicking through water. Progress to the narrow, hidden, fast big toes brushing, small hip range, straight on the upsweep movement, bend on the down beat. Have a good think about the mechanics of your kick this week. If you were swimming head on towards a submerged camera and you reviewed your footage afterwards, your kick should not be visible. – Static horizontal kicking holding the wall as active recovery between lengths. Feel the toes bubble at the surface. – Hands on Glutes to think about the correct muscles lifting a straight leg back up to the surface. – Add dryland to supplement and accelerate your kicking progress. Why bother with all of this focus on your leg kick? In our experiences coaching swimming we know that a bad kick is devastating in terms of incorrect propulsion and higher energy costs. We know mechanically that the legs do a lot of damage in terms of drag and form. 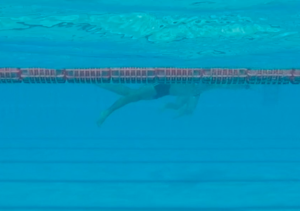 Toes pointing down, excessive two way pivot at the knee, and pedalling through the water all undo the work of your arms as they try to pull you forwards. Correct your leg kick and you will certainly find that your swim training will become a whole lot easier. 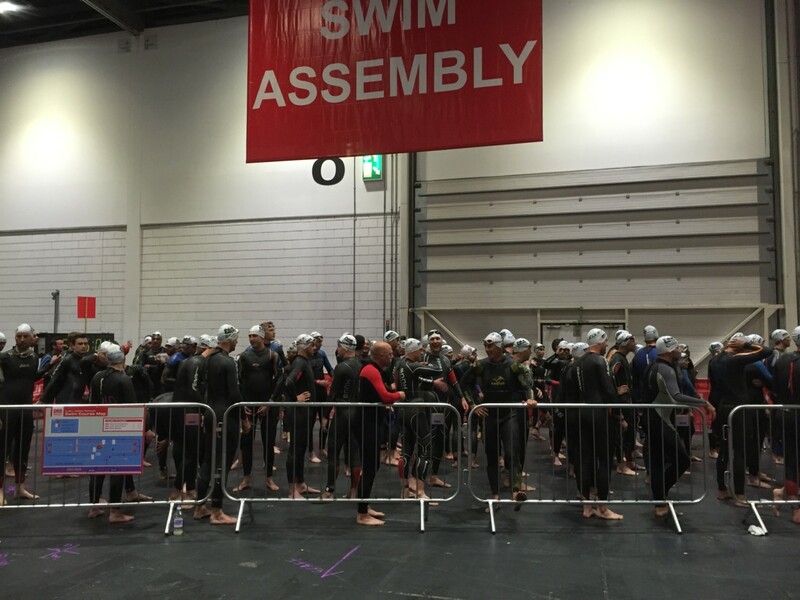 The London Triathlon, read the instructions…. It is the London Triathlon this weekend, an event I hold dear since it was my first Triathlon 20years ago exactly. It launched a long and enjoyable career that took me to Ironman Lake Placid and South Africa, World Triathlon AG events in Edmonton and Cancun and then onto pure Openwater swimming events. All of this came together with a desire to coach, help people and contribute to the world of Triathlon and so SwimforTri was born soon after. There is a lot to this particular event, the unusual exit to the swim, the intimidating high sided walls , the odd taste to the water, grey landscape and the length of the docks. They seem to go on forever, making you feel in your head like you are not making progress. There are enough things that can play out of your control so do your best to be in control of as many controllables as you can. So far this week at lessons with just a few days to go people are still struggling to stop goggles from leaking, wetsuits from chafing. Stop swapping kit and trying new things <if they work> at this late stage. Start to pay attention to the details now and read the literature available on the website. Don’t be asking fellow competitors in transition how many laps it is, there are many different race scenarios through the weekend and that friendly neighbour might be telling you his race details which might not be yours. Know the direction you are swimming, any useful sighting vantage points?, how many laps? which colour are the turn buoys? what colour are the ones you travel straight past. Often the corners of a rectangular course are different to the mid point markers helping you not turn early. Might it not be wetsuit? do you need a tow float if that is the case? will it be sunny or overcast? light or dark goggles? should you leave your hat and goggles on your head while you take off your wetsuit? they could get stuck in your wetsuit sleeve while stuffing your suit into the plastic bag they hand out. If you have wetsuit in one hand <in its plastic bag> and hat&goggles in the other are you comfortable running up stairs without holding the bannister? Where did you leave your bike! This is one of the few races where regardless of the time you arrive you can watch many competitors starting in the waves ahead of you. If you arrive early and give yourself plenty of time. You can see the mistakes being made. Sorry if you are in the first few waves on Saturday, this excludes you and some might be watching so please prove me wrong and get it all done correctly! Watch and learn. A few years ago I was racing the OW champs in Norwich and my uncle came to watch. Bill is a keen fisherman and suggested I avoid a certain stretch that was on the racing line. He offered that due to the ducks and swans feeding there, the weed was high and we might get tangled in it while swimming over it. I watched the earlier waves and sure enough. 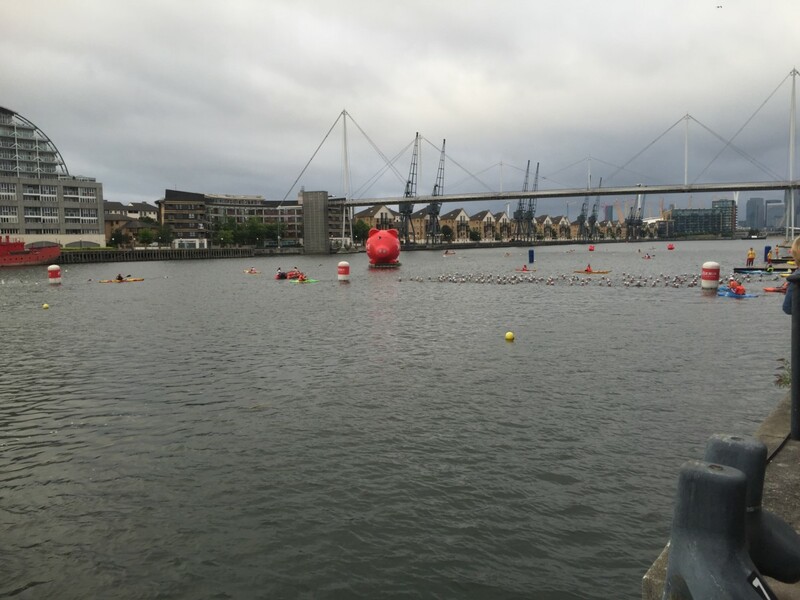 I swam around it and dropped the swimmers near me on the home stretch. Watch how others swim around the course, is something leading them astray? a current? a sighting point on the course that is not actually right on the racing line and you might be better staying to the left/right of it. Be careful of those slower swimmers on their second lap as you start your race right right behind them, be careful of your fingers as you overtake especially of those swimming breaststroke. The slightly congested conditions present certain challenges you might not have experienced before. 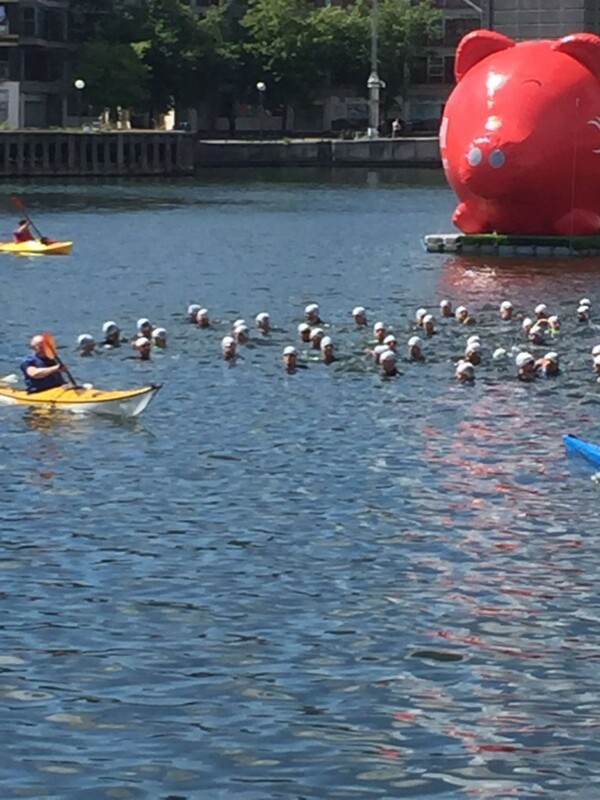 I led out of the water back in 1998 and this I did not expect from my first race and at that point as I then exited Transition minutes behind the new leader I wish I had read some instructions.